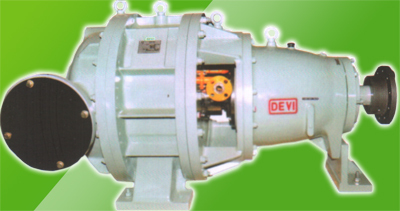 Devi liquid ring compressors are rotary machines in which the liquid is made to act as piston. This liquid will vary depending on the gas to be compressed the overhung shaft is supported by Angular contact bearings. Shaft sealing is provided by mechanical seal. We are having various models to suit the customer requirement. Our manufacturing range starts from 150 m3/ hr to 2500 m3/hr depending on operating conditions. Chlor Alkali Industry : For compressing Chlorine Gas. Petrochemical Industry : For compressing highly inflammable Gases like Flare Gas, Propane etc.,. Steel Industry : For compressing Argon Gas. For compressing Air, Hydrogen peroxide and other critical Gases. These Compressors are used in highly corrosive and critical gas applications. At present we are manufacturing Single Stage Compressors which can develop a Pressure of up to 4.5 bar and on the verge of developing two stage Compressors for pressures up to 7.5 bar. Shaft Sealing : Generally, we supply the Compressors with Mechanical Seal, but it may change basing on the requirement / specification of end user. b) CE / PED Certification for Pressure Vessels. So far, we have developed and supplied more than 250 Liquid Ring Compressors for various critical gas applications in India and neighboring Countries and all are giving satisfactory Performance. We have done many Projects in association with agencies like M/s. Uhde India Limited, M/s. 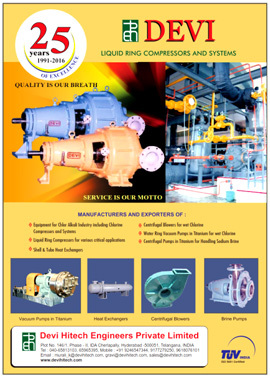 Simon India Limited and offered third party Inspection with M/s. Lloyds, M/s. Projects Development India, M/s. TATA Projects, M/s. Bureau Veritas, M/s. TUV Nord etc., agencies. We are empowered with a vision to supply Quality product with Superior Metallurgy to ensure longer life combined with better performance and offering service for the optimum utilization of technology by the Customer. This vision has helped us to improve the recurring business while venturing into new areas. To gain broader client base, we facilitate our esteemed clients with custom made systems to suit their requirement. We also share the technology up-gradation of the products with our clients from time to time. Our Devi Compressor parts are made of superior matallurgy. We are supplying in various grades of materials like Alloy cast iron, Cast Steel, Stainless steel, Alloy 20, Haste C and special grades of Stainless steels depending on the system requirement. Hence our DEVI compressors will give better performance and life. Back Pull Out design minimises the down time considerably. Hence for maintenance of bearings or mechanical seal, the total rotating assembly including the bearing bracket can be taken out without disturbing the main Gas / Acid Piping. Devi not only supplies the Liquid Ring Compressors alone, but also with all Accessories such as Service Liquid Cooler, Acid-Gas Separator, Acid Surge Tank, Interconnecting Piping, Valves, Fittings , Gauges and Instrumentation to form a complete system. Copyright © DEVI HITECH ENGINEERS PVT LTD 2018. All rights reserved.